There is a reason people continue to create art even when they discover that there is usually no money in it. The creative capacity that exists within human beings is essential to our existence. It is arguable that our creative abilities are even divine. It is widely believed that humans are a result of a divine being’s creative process, which was instilled into us. Creative projects are more than just fun, they are a high-calling. When it comes to creative projects in the visual arts spectrum, the therapeutic possibilities are endless. What we typically think of as art is an aesthetic arrangement of materials that impact the viewing audience by carrying meaning. Arriving at the destination of meaningful art is consistently a meaningful process. This meaningful process of journeying to fulfill an artistic vision is the part that is most important to people. The creative journey requires introspection, examination, integrity, self-awareness and connection to one’s emotions. Going through this process does a great deal of good for a person’s mental health. Because most of us are exposed to visual arts projects at a very young age, many of these abilities are inherent. The way that visual arts projects can help people through difficult life circumstances is very unique and beneficial. Creative projects are to difficult emotions what lubrication is to an old bike. They get the gears moving and working. When someone experiences the loss of a loved one, a divorce, being laid off or any other circumstance that causes grief and stress, getting out the art supplies can be the best way of healing. Any creative process will ignite the same faculty that processes major life changes, but the visual arts in particular are very good for high emotions. Sometimes our personal emotions are too big to express logically, and incorporating the use of color or sound is a more effective way of expressing meaning. Working on a visual art project can also help alleviate disorders, addictions and substance abuse. Other than the mental health benefits described above, the visual arts can also be very useful for connecting with areas of the brain that have not been tapped into for a time. 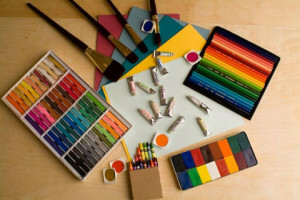 Coloring or doing arts and crafts is known to be one of the best ways of channeling your inner child, when can help you make huge strides in defeating a mental hardship.